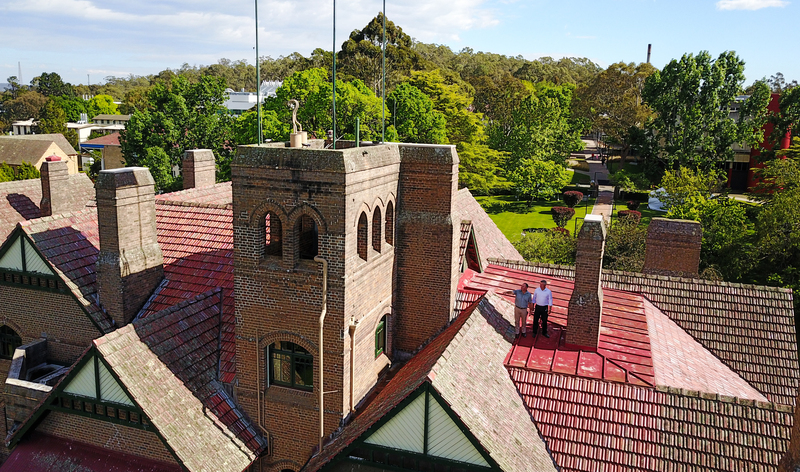 Work will start this week on the restoration of the roof of the University of New England’s heritage listed administration building, the historic Booloominbah. The work will include the repair of damaged roofing fabric and roof plumbing, including terracotta tiles and capping, lead flashings, metal roof decks, and painted gutters and downpipes. The mortar on cappings and ridges will also be repointed, while all painted surfaces on the exterior of the building will be renewed. To ensure the work is carried out with minimal disruption to staff and students, it will be undertaken in two stages over six months: the eastern half of the building from November to February and the western half from February to April. Scaffolding will be erected around the perimeter to facilitate the work and will remain in place for the duration of the project, which will be undertaken by Newcastle firm Compton Projects at a cost of $1.4 million. UNE’s Chief Operating Officer, Professor Peter Creamer, said the work will help to maintain the integrity and aesthetics of the building, and was part of a $26 million schedule of maintenance and renovations at the University over the next 14 months. “Booloominbah is not only a valuable asset for UNE but it is a heritage listed building of State significance, and we have a duty to maintain it and ensure it is structurally sound and in good overall condition,” he said. “We will also take advantage of the scaffolding around the building by repainting window frames, gable ends and other painted surfaces. Prof Creamer said the roof restoration was a continuation of the maintenance that had been carried out in the Booloominbah precinct over the last 12 months, including the restoration of the front lawn stone wall, the carpark stone wall, and the installation of upgraded drainage and external lighting. “While the roof upgrade is being completed we will also be replacing timber and glass in the conservatorium on the north-eastern side of the building,” he said. Booloominbah was donated by the White Family to help establish the New England University College in 1938, eventually becoming the University of New England in 1954. It was designed by renowned architect John Horbury Hunt and when completed was the largest private residence in Australia. Photo: UNE Facilities Management Services Project Officer Craig Dussart and Project Development Manager Chris Petrov (white shirt) inspect the roof of Booloominbah in preparation for the commencement of restoration works this week.